Select Tilt Tray Group Pty Ltd initially started operations in 1994 as “Select Towing Service”. Since adding a second truck to our fleet in 1997, our growth has been almost unstoppable. We have since adopted an owner driver policy, therefore the driver turning up to do your job owns the truck. 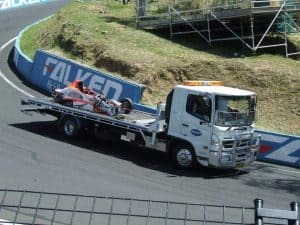 The theory is that as the owner of his own business, the driver will do your job, whether its caravan towing, accident towing, long distance towing or short distance towing, properly and safely. In practice, this has proven to be so. We also offer outstanding car towing service. We still run two of our own trucks though with company drivers for those urgent jobs. Some of the drivers at Select have been known to me for up to 35 years and many who I did not know before starting with us have become more like friends than towing drivers. Between all the drivers we have more than 277 years of experience in towing! As our business grew we were gaining people from all industries including welders, mechanics, panel shop owners, salesmen, engineers, car carrying, garbage collecting, concrete trucks and even pathology and the police force. We are a “service first” company and will do anything we can to make the job as easy and hassle free for you, our customers. Most of our business is achieved through “word of mouth” which in my view is the best form of advertising. We currently service hundreds of regular customers and cover approximately 150 transport movements per day all over the state. Long distance towing is also catered for. All of our trucks are late model (for reliability, comfort and appearance) and we provide full insurance towing with “on hook” insurance and public liability insurance, complying with Tow Truck Authority requirements. You can rest assured that we have the correct insurance cover in place for your goods whilst in our custody and we understand this is important to those who need high end car towing service, caravan towing, accident towing and long distance towing. Copies of insurance certificates of currency can be faxed or emailed upon request. Covered enclosed transport is also available for rare or exotic vehicle transport requirements, both locally and interstate. All of the towing trucks are able to be operated by remote control, allowing the driver to keep a better eye on loading and unloading procedures. The drivers are all well trained in every aspect, including caravan towing, accident towing and providing excellent car towing service. From loading to different ways of securing cars and machinery, to height and weight awareness, right down to OH&S responsibilities, customer relations and road rules, we do it the right way! Most of the drivers have MSIC cards for waterfront work, Yellow cards for transporting access equipment, forklift licences and “Bluecards” to show OH&S training. We pride ourselves in a clean and tidy fleet of trucks and our well trained professional drivers. Whilst providing a quality car towing service, our drivers are experienced operators who will take extreme care of your vehicle. As we hold a marine insurance policy, your vehicle is fully insured whilst loading, transporting and unloading, so you can breathe easily in the thought that your vehicle, machinery or caravan is in good hands. We possess safe work method statements and risk management documentation as required to fulfil our OH&S requirements. Here at Select we believe in good old fashioned service at the best price available. We are not into gimmicks and discounts and we aim to offer the best price to our customers at the first instance, so there is little room to move with our pricing as you will already be getting the best price first time. It is always wise to compare prices so we would encourage you to try us and receive a pleasant surprise with our towing quote! Nearly all of our work comes from repeat business or recommendation. Our allocator at Select is Rick Bakewell. Rick has been involved in towing for the past 40 years and has owned his own towing company in the past. Rick was a top boat racer for many years until injury and a near death accident forced him out of the sport he loved so much. David Harris is our assistant allocator and has recently started with us to assist Rick to get the job done. I am Chris O’Riordan and had worked with Rick at Kareena Towing for many years before starting Select. 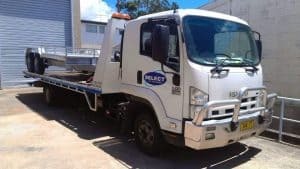 I have been involved in towing and transport for all of my working life, starting out in 1974 doing NRMA towing at night as a second job to supplement my low pay at my day job which was in the bank. I was only on $35 take home per week. After a breakdown in my car and needing to be towed I thought it was a good way to earn extra money by doing towing work as the work was always there in some form or another. I soon left the bank to join “Capo” at Caringbah Towing and began doing heavy towing in an old V8 Cummins Acco which took me around much of NSW and occasionally interstate. I was only 18 at this time, so I learnt a lot about trucks and towing quickly. I then got a job at Johnstons Transport Industries at Alexandria (later to move to Marrickville) and worked with Frank and the boys for the next 8 years where I got a semi licence and learnt a lot more about transport, carting anything from shipping containers, reels of paper or coils of steel and doing a lot of wharf work and machinery relocation. I still drove towies on weekends doing accident towing work. After that I worked with Garry Phillips for 5 years at Kareena Rd Smash Repairs doing smash work, then started with Rick at Kareena Towing in 1988 doing mainly NRMA salvage work and long distance towing. Then came 1994 when Rick decided to sell his trucks to the drivers. Select was born. Michelle is our administration manager and will often answer your calls, along with Rick and David. It is Rick and David’s job to make sure times are kept and to assist in customer communications. Together we will assist you with whatever you need to be transported (car, caravan, machinery) and we look forward to being of service to you.